"That thin green line of cotton- woods down there is the Little Colorado River," Flo was saying. "Reckon it's sixty miles, all down hill. The Painted Desert begins there and also the Navajo Reservation. You see the white strips, the red veins, the yellow bars, the black lines. They are all desert steps leading up and up for miles. That sharp black peak is called Wildcat. It's about a hundred miles. You see the desert stretching away to the right, growing dim -- lost in distance? We don't know that country. But that north country we know as landmarks, anyway. "Look at that saw- tooth range. The Indi- ans call it Echo Cliffs. At the far end it drops off into the Colorado River. Lee's Ferry is there -- about one hundred and sixty miles. 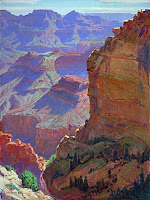 "That ragged black rent is the Grand Canyon. Looks like a thread, doesn't it? But Carley, it's some hole, believe me. Away to the left you see the tremendous wall rising and turning to come this way. That's the north wall of the Canyon. It ends at the great bluff -- Greenland Point. See the black fringe above the bar of gold. That's a belt of pine trees. It's about eighty miles across this ragged old stone washboard of a desert. . . .
Now turn and look straight and strain your sight over Wildcat. See the rim purple dome. You must look hard. I'm glad it's clear and the sun is shining. We don't often get this view. . . . That purple dome is Navajo Mountain, two hundred miles and more away!" Carley yielded to some strange drawing power and slowly walked forward until she stood at the extreme edge of the summit. What was it that confounded her sight? Desert slope -- down and down -- color -- distance -- space! The wind that blew in her face seemed to have the openness of the whole world back of it. Cold, sweet, dry, exhilarating, it breathed of untainted vastness. Carley's memory pictures of the Adirondacks faded into pastorals; her vaunted images of European scenery changed to operetta settings. She had nothing with which to compare this illimitable space. 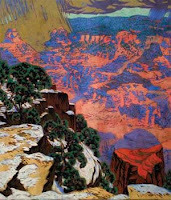 Until the late 19th century, much of the Southwest was a mystery to Americans. Rarely did people venture into the remote corners of New Mexico and Arizona territories, which became part of the U.S. in 1848. 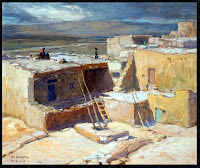 However, writings by such people as Charles Lummis, Mary Austin, George Wharton James, and others, and representations by artists such as Ernest L. Blumenschein, Bert Geer Phillips, and Oscar E. Berninghaus, began to appear in the late 19th and early 20th centuries. Ethnographic interest in the native peoples had existed since the earlier surveys and military movements which encountered these populations. No longer considered a "vanishing race," Native Americans became mythologized through the popularity of their artwork and culture. 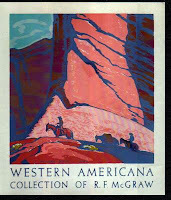 when arizona and new mexico became part of the united states in 1912 they were ripe for the railway tourism which had begun when the transcontinental railroad was completed in 1885. as happened in europe, the need for railway posters at that moment gave the new printmakers an opportunity. folks who saw the posters and read the books had to go and they told their friends who came for short visits and stayed. they came from norway and sweden and england and germany and japan; the world was beckoned and the world responded. 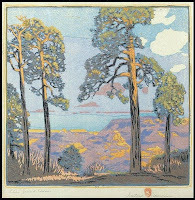 here, the plains/planes of flat color and the simple lines that had been pored over in the japanese prints came intensely to life. the shapes and shadows and tones called to the imagist poets. “In a cold like this, the stars snap like distant coyotes, beyond the moon,” I read. “And you’ll see the shadows of actual coyotes, going across the alfalfa field. And the pine-trees make little noises, sudden and stealthy, as if they were walking about. 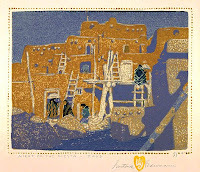 "I think that New Mexico was the greatest experience from the outside world that I have ever had. 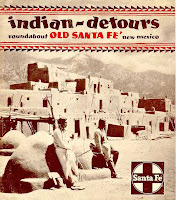 It certainly changed me forever...the moment I saw the brilliant, proud morning shine high up over the deserts of Santa Fe, something stood still in my soul, and I started to attend." 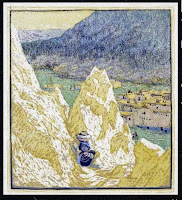 As the wagons went forward and the sun sank lower, a sweep of red carnelian-coloured hills lying at the foot of the mountains came into view; they curved like two arms about a depression in the plain; and in that depression was Santa Fé, at last! of cholla spotting the swales. sings all my life to me. 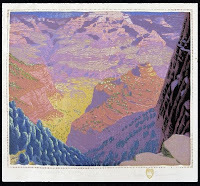 for a wonderful essay on how christopher buckley came to write a long series of poems based on the painting of georgia o'keeffe, click here. 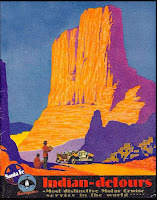 I love the art of these old travel posters, and you have some splendid examples here. Thanks for posting. 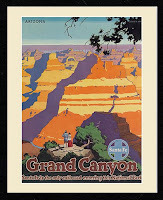 When you visit the Grand Canyon, you will often find a warning on the maps and travel literature cautioning tourists from Europe that they should not apply European notions of scale. They are told that everything is far bigger and more spread out than anything they are accustomed to, and they should plan accordingly. Ahh, more tasty visual treats. Yum. so glad you like them, dominic!